It’s late March. A new school year is just around the corner. As a teacher, I rarely give thought to my counterparts working away in the public junior high education system. We are “counterparts” in name only: “teachers”. But our work couldn’t be more different. They teach English as a system to memorize for the purpose of passing tests, I teach English for the purpose of communication. 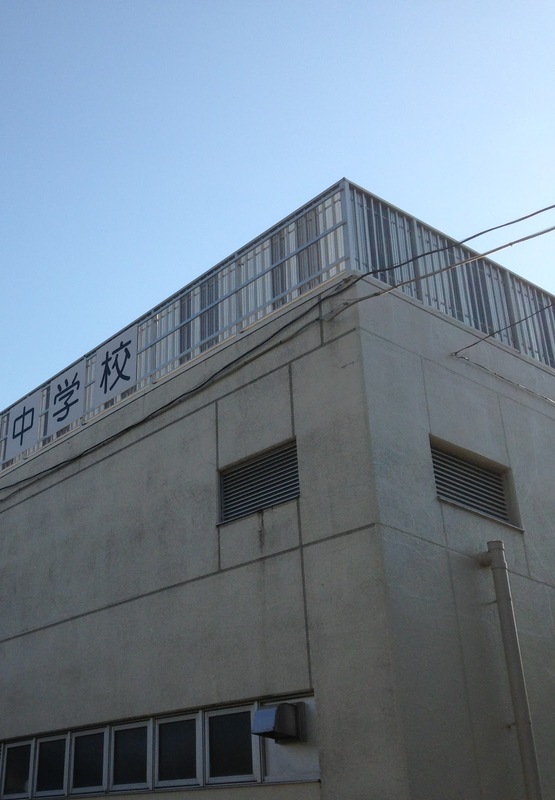 They teach English by and large in Japanese, I teach English in English. My approach takes students’ self-esteem into deep consideration, their approach does not. They give feedback to students’ efforts in the form of noughts and crosses on answer sheets, I give students the opportunity to self-correct problem areas, and all effort is good effort. I take care to have my students feel success with English by having them actually use it, my junior high counterparts don’t. And I’ll be frank; not only do I feel so very little in common with public junior English teachers, I often feel that much of their work goes against what I’m trying to achieve with my students. During the test, if the student answered anything less than the memorized answer, it was considered incorrect. For example if the students answered “Tea” instead of “I prefer tea”, it was marked as incorrect. Similarly, if students answered “November 15th” or even “My birthday is November 15th” instead of “My birthday is on November 15th”, it was marked as incorrect. A total score out of 10 was calculated. Now OK, I haven’t met or talked with the teachers who designed and conducted this test so I cannot know their thinking behind it. But I must say that I have some serious qualms about this test, particularly as it relates directly to students’ assessment of their speaking ability. You would imagine that a “speaking test” would have some element of communication to it, but there was none here as the questions and their order were pre-given. The Monbukagakusho guideline of English education stipulates that its purpose is communication. English tests like the one described here send a totally unhelpful message to our students. Instead of being a valuable and important tool for learning about others and sharing one’s ideas, English becomes a process of accurate recitation, of form over content, and the slightest technical error costs you marks. With English education like this, it’s no wonder that Japanese communication ability in English is low compared to nearly all countries where English is a foreign language. It’s late March, and a new school year is just around the corner. So I call on my counterparts in the field of public education; instead of working against each other, let’s work more closely together. Let’s meet up with other English teachers in the community, join their teacher-development meetings and study groups. Let’s share perspectives on our students, their future and on the role of the English language within it. We are all teachers but currently we are doing disservice to our students and our profession. I believe that with cooperation we can work for our students more efficiently and effectively. Hopefully too I may be able to have a conversation with my students about their school English education without cringing! We go to different schools. I didn’t get LINE from Yuka. At the 15 minute mark I had the students sit together and brainstorm all the English they had used in the last 15 minutes, since entering the classroom. 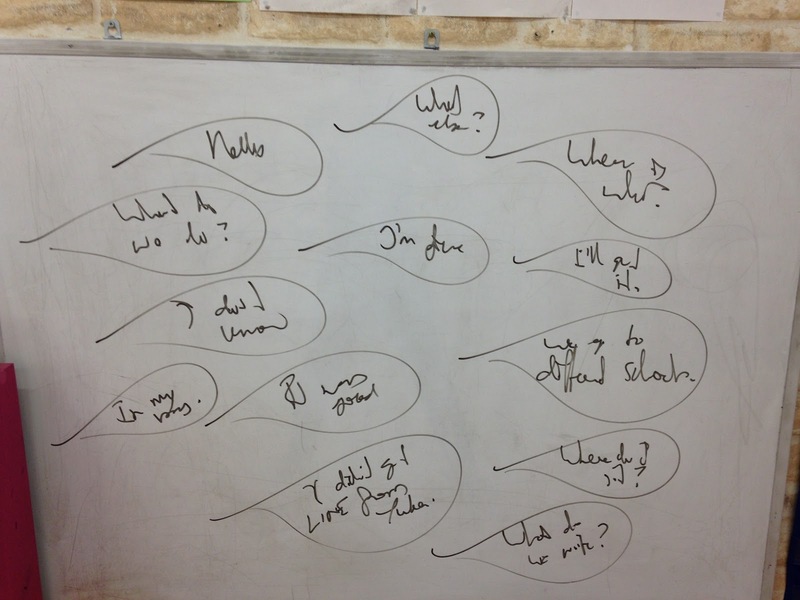 I wrote each expression on the whiteboard as the students recalled it – however as you can see from the photo, my writing was (deliberately) messy. I then had the students write all the expressions in their notebooks. Move please, Matthew. I can’t see the whiteboard. All were added messily to the list on the whiteboard and subsequently to the list in the students’ notebooks. The lesson became truly representative of the compromise I had reached with the students. It involved writing, grammar discussion, and most importantly, real English communication. In your teaching schedule, do you have any JH classes? While teaching younger kids is my forte, this year I have more JH classes each week than at any other time in my teaching career! I quite like them. JH students have a complex mixture of attitudes towards English, school, their teachers, their families, their friends and themselves. I find myself preparing well for these lessons because unlike younger students, these kids fully know when I don’t! I’m fortunate that for the most part my students seem to enjoy my lessons. Most (but not all) of them have come through a Learning World experience, and we’ve built a good degree of mutual trust over a good number of years. However, I was surprised to learn recently that one of my students, JH 2nd grader, was considering leaving my class because she felt it wasn’t meeting her needs. She wanted a class that was “more focused on reading, writing, grammar and Japanese explanation”. With more focus on these areas, she felt she could do better at her school English, as her school lessons shared the same focus areas. For the record, my JH lessons are designed around grammar points taken directly from JH textbooks, and include activities that involve reading and writing. Every time. My student likely missed this fact because the communicative nature of the lessons may have hidden it. She was right though when she claimed that my lessons don’t contain any Japanese explanation. I don’t believe Japanese explanations are necessary. But I must acknowledge that my student believes they are. In fact she had voiced her concerns with me regarding this on a previous occasion as well; it was clear though that my reasons for not including Japanese explanations hadn’t convinced her. I definitely didn’t want her to quit, so I decided to compromise. In class the following week I announced that the lessons from now on would contain Japanese explanations of grammar rules and structure. These however would not come from me – they would come instead from the students themselves. I suggested that whenever anyone felt the need for a Japanese explanation, they were welcome to ask for it from their classmates, and classmates were welcome to give it. I would continue to use only English but I would not discourage Q&A about grammar conducted in Japanese. I’m happy to report that the student began to enjoy her class after we implemented the change – and in fact, the class atmosphere generally warmed. The students liked my insistence on only using English with them because they felt benefits to their listening ability. However they also enjoyed the opportunity to confirm areas of grammar among themselves in Japanese. Can I share with you this piece of writing by one of my students? She is in junior high 2nd grade, and has been studying with me for 50 minutes a week since she was in 1st grade elementary school. Her first textbook was WELCOME to Learning World Blue. She has since completed every textbook in the LEARNING WORLD Series. 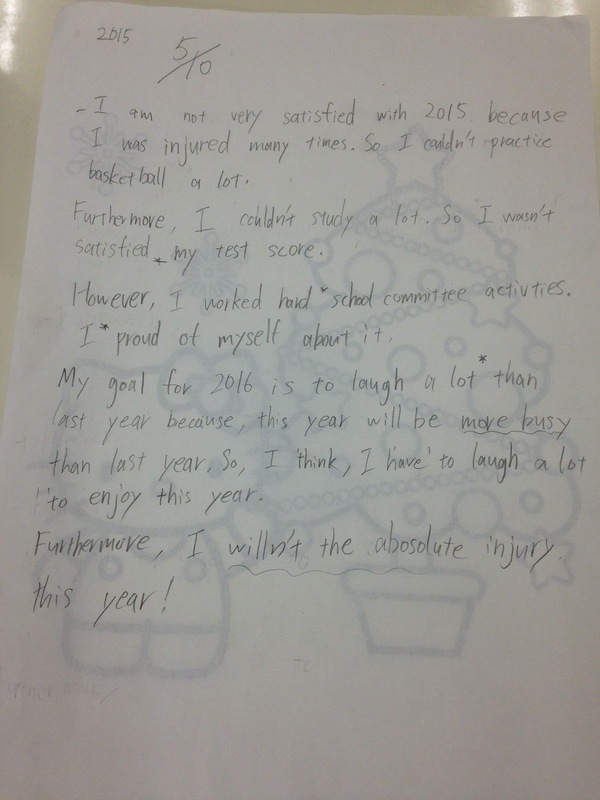 I am not very satisfied with 2015 because I was injured many times. So I couldn’t practice basketball a lot. Furthermore I couldn’t study a lot. So I wasn’t satisfied my test score. However, I worked hard school committee activities. I proud myself about it. My goal for 2016 is to laugh a lot than last year because this year will be more busy than last year. So I think I have to laugh a lot to enjoy this year. Furthermore, I willn’t the absolute injury this year! Yes, it’s clear that her writing is not free of language errors. But to be honest I was quite happy with it, and surprised at its quality. The writing of a reflection on 2015 and goals for this year, together with the vocabulary “satisfied”, “furthermore” and “however” was my idea, but everything else was hers. 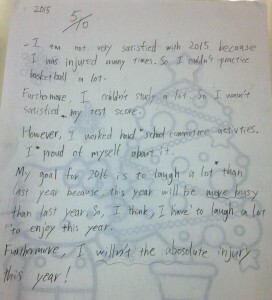 ■Step 2: On a piece of paper I asked her to write “2015:” and then give it a score. 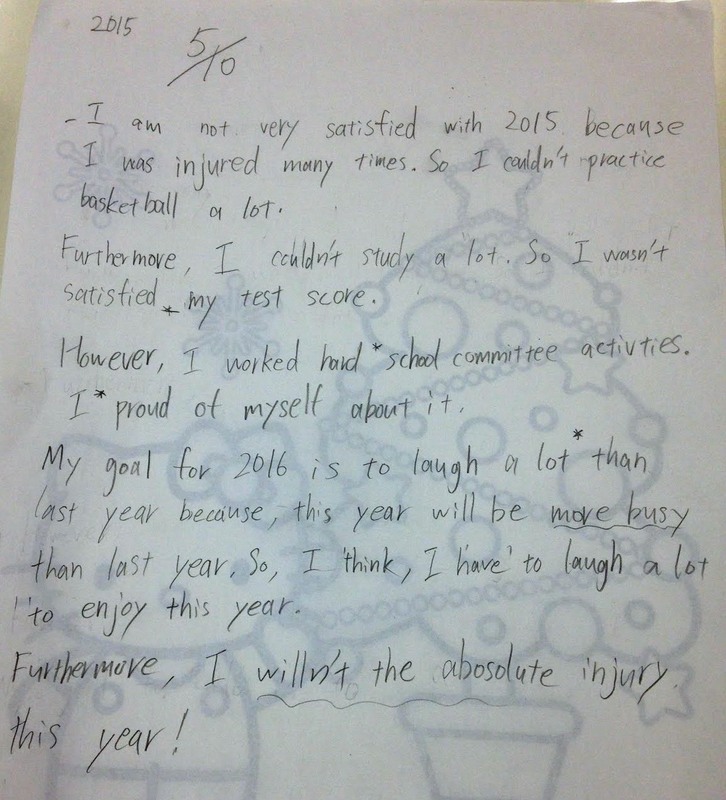 “I am not very satisfied with 2015 because…………. My goal for 2016 is……. ■Step 4: On completion of the dictation I explained that “furthermore” means “and”. And I explained that “however” means “but”. ■Step 5: I asked her to complete it for homework. The combination of her junior high grammar knowledge with the structure provided by me helped put her ideas onto paper. By all means, please use this idea as an end-of-year activity, or even an end-of-term activity. Creative writing is definitely facilitated by experience in reading. These two areas of English education will be dealt with in depth at this year’s LEARNING WORLD Workshops, scheduled for Feb.28th (Osaka), Mar.6th (Nagoya) and Mar.13th (Tokyo). ★★Learning World WORKSHOP INFORMATION⇒⇒Click here!